Reference of available graph metrics in OpsCenter monitoring for DSE Graph. 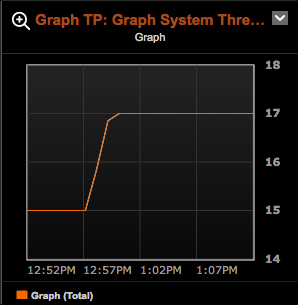 Alerts are also available for all Graph metrics. Note: DSE Graph metrics are available for DSE versions 5.0 and later. There is one exception: The Graph Request Latencies metric is only supported in OpsCenter for DSE versions 5.0.5 and later due to the underlying JMX MBean for the metric being renamed from datastore-latencies to request-latencies in DSE. Cache metrics: Cache metrics bound to a specific DSE graph. Per node per graph instance metrics. Request Latencies: Histogram of request latencies. Threadpool metrics: Global-level threadpool metrics for tasks that have active, pending, and completed threads. Metrics for hits and misses to the adjacency and index caches used by DSE Graph. Note: The graph must be configured at schema creation time to use the adjacency or index caches. For more information, see caching. Note: The Graph Request Latencies metric is only supported in OpsCenter 6.1 and later for DSE versions 5.0.5 and later due to the underlying JMX MBean for the metric being renamed from datastore-latencies to request-latencies in DSE. Graph query threads, Graph scheduled threads, Graph system threads, and Graph Gremlin worker metrics for pending, active, and completed threads in the respective threadpools. Threadpool metrics are global across all graphs. The Graph list is only applicable to the per graph cache metrics. Tip: Clone the Default preset tab and give it a name such as DSE Graph to organize your dashboard. 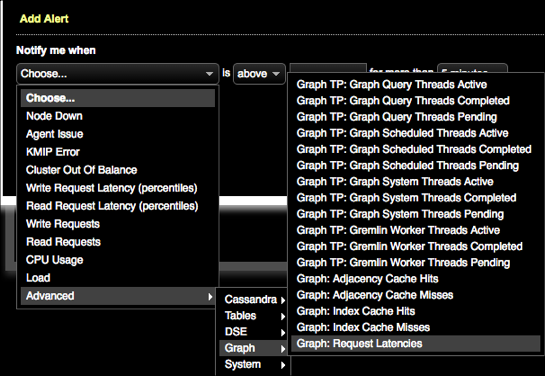 Alerts are available for all graph metrics. 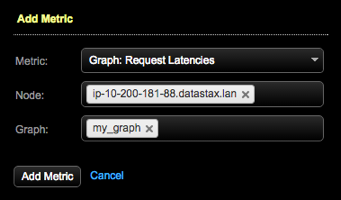 Click Alerts > Notify me when > Advanced > Graph > Graph metric in the Add Alert dialog. Define the notification criteria for each alert required for monitoring your DSE Graph environment.